You can see what accessories I’m using for my X100T in the picture above. I’ve also posted more pictures at the bottom. Although most of the same accessories for the X100T work for the X100F, I’m made a new accessories page just for the X100F. The body design has changed as well as the battery. Here are a few battery options. I have Fuji for the X100T, and the STK, BM and Wasabi for various other cameras. They are all great and all seem to hold a good charge. I know some third party batteries lie about their capacity, but lately the following batteries seem to hold true. If I had to buy more batteries, this is the order it would go. There is a voltage difference between the original Fuji battery and the 3rd party. It will make a little difference but likely not noticeable. The mAh will represent how much charge it holds, bigger is usually better. Notes: I’ve had a lot of problems using third party batteries with my Sony A7r. The problem I was having is that the charger kits that come these cheap batteries don’t charge the batteries well, or they charge them too fast resulting in a bad charge. So I would have to charge the 3rd party batteries with the Sony charger or in Camera then everything was good. Luckily the X100T comes with a charger. Thank you Fuji! I haven’t really seen a lot of camera savvy technophiles talking about this camera since it seems to attract the hipsters with a little more cash. But from what it seems, this camera does have a memory buffer it is just ridiculously small. I thinking probably about 100MB vs the 500MB Sony puts in there cameras and the 2GB of Leica. In that case you’ll want to get the fastest card possible because you’ll only be able to burst about 5-7 shots before filling your buffer. Then it is all about SD card speeds. The memory card interface on the X100, X100s and X100t is only UHS-I, so don’t waste your money on a UHS-II card. See my list and speed tests of memory cards. The Fuji X-E2 screen protectors work perfectly on the X100T. And I can confirm this. Here are a few. If you don’t have a thumb grip or don’t plan on getting one, then the terminal protectors are very nice to use when you’re not using an external flash. Comes with a Hot Shoe Cover, Sync Terminal Cap & Vertical Grip Cover. Only the Hot Shoe Cover works on this camera. Set up your camera with a soft release button. There are so many options out there it’s hard to decide. Here are a few popular ones but there are many options besides these. Right now I see a lot of people ordering the 10MM Diameter one probably because they are cheaper, but they do fall off occasionally because they lack a rubber spacer that keeps them from vibrating. The Lensmate has the rubber spacers but are pricey. The thumb grips are really nice to secure the camera in hand. The camera already feels solid, but getting one of these just makes the camera feel sooo nice. 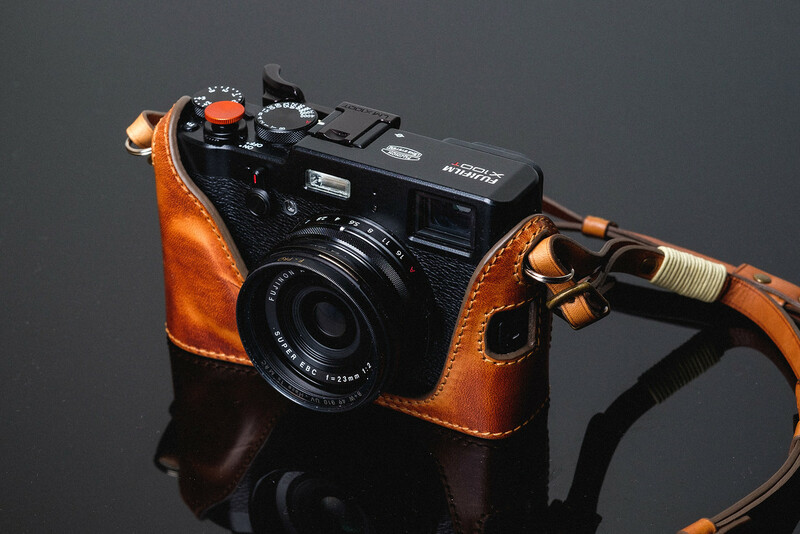 The Lensmate Thumb Grip For the Fuji X100T are now available. Color on the black version is a bit off. 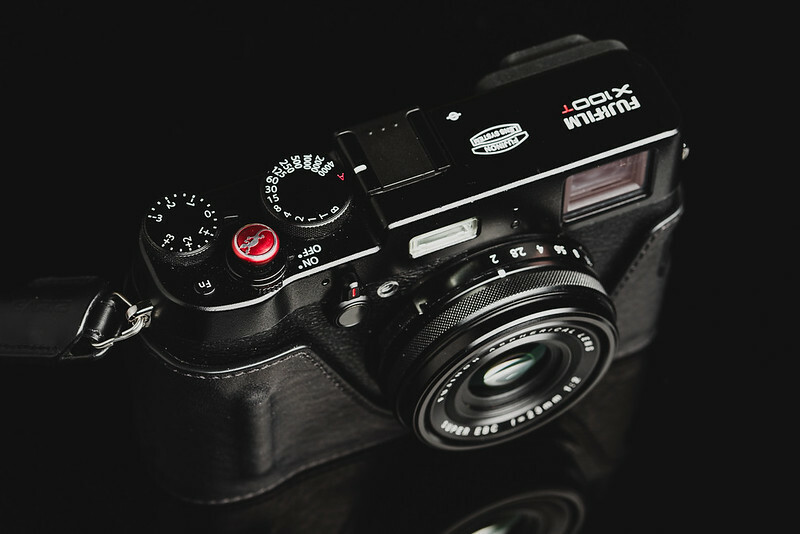 See my Lensmate FujiX100T Thumbrest Review. So far the only case I’ve tested out is the Gariz leather half-case. I really like it. Although it was originally designed for the X100s and X100, it also fits the X100T great. See my full Gariz Leather Half Case Review. No tripod mount on the bottom. See the Kaza Deluxe Review. 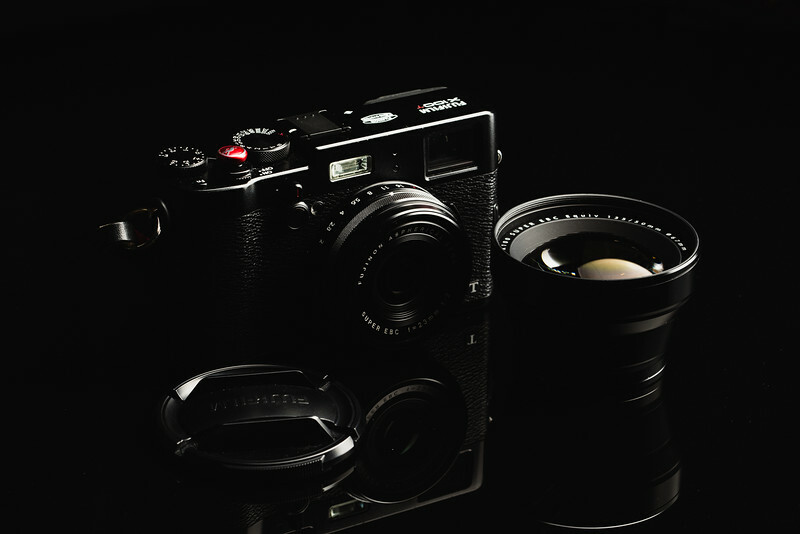 The Fujifilm X100T has a fixed lens but there are several enhancements availabe as well as lens adapters to change the focal length. These are pretty important for a fixed lens camera like this. Especially if you use it while you’re drunk at a party. You can’t just send your lens in for repair or replace it like you can with an interchangeable. Fujifilm finally wised up and started selling these at a reasonable price. This is the adapter by Fujifilm. Looks great, comes in silver and black. This is for if you want to just be able to attach filters to your lens. It sticks out slightly so it will provide some sun glare protection, but not as much as with the adapter plus hood. Black & Silver Available. Pricey, but you get the official Fujifilm adapter ring plus a lens hood. Black & Silver Available. JJC has two versions of this now, the JX100 and the JX100II. The JX100 lens hood opens fanning out. the JX100II hood folds on. The JX100II lets you use the Fujifilm lens cap. If you don’t use the lens hood and want to just attach a UV filter, either choice will work. I actually ordered the JX100 for my X100F and got the II. Not sure if they discontinued to standard version. This is a nice lens hood as well. This is actually what I bought for my X100T. It comes with a filter that will probably fall apart on you after a month like mine did. Consider order a good UV filter with this. Personally usually by B+W. They have Multi-Coated Nano UV filters now that seems to stay clean a little better, but they are often more expensive. There are new versions of these conversion lenses. I’m not yet sure if they work on the X100T or X100s. If you want a really simple wrist strap the Gariz is great. I have a few and have had them for years. Some of them are really beat up but still hold together well. The colors do fade after awhile. They do have that sort of mass produced made in China feel to them, but they’re still very durable and well made. Gordy’s makes some great full straps as well as leather wrist straps. If I had to pick I would take a Gordy’s over the Gariz since they are both a similar price. The Gordy’s strap has more of a handcrafted feel, where as the Gariz feels a bit more China made / mass produced. 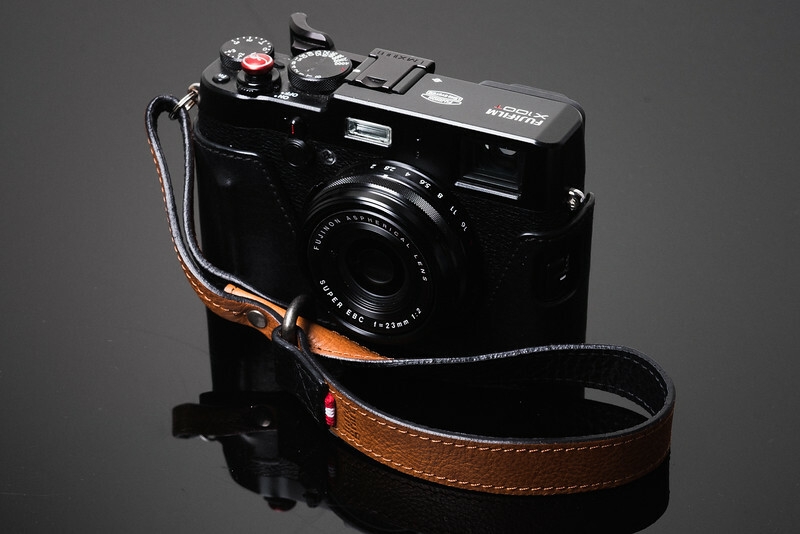 Tap and Dye – Camera Straps and Wrist Straps – One of the best American made straps. Gordy’s – Horizontal / Vertical / Sling – This guy makes some fantastic stuff. 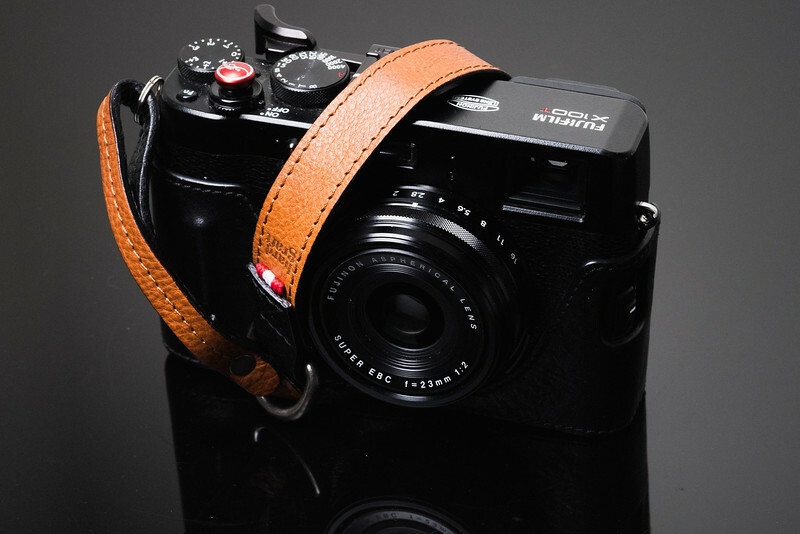 HardGraft – (Instant Camera Strap) – Most of their straps are probably too bulky for this little camera. 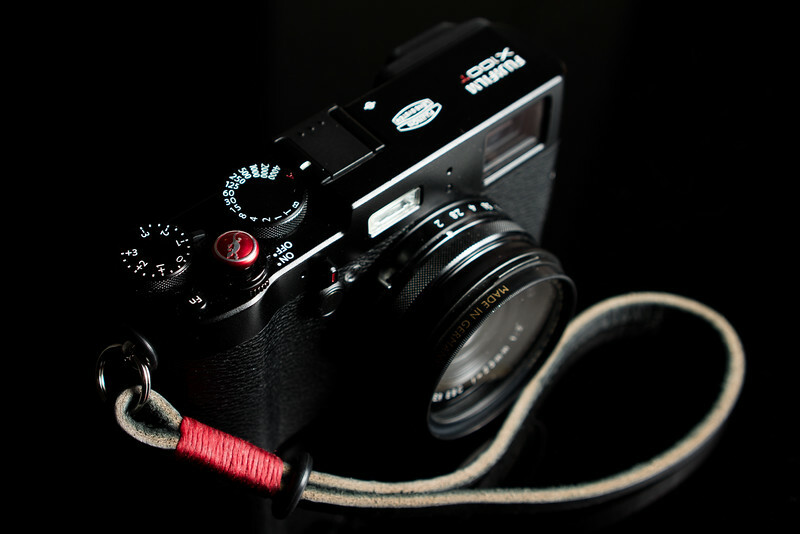 LeicaTime Straps – (Leicatime.com) – This is the strap I use in the first photo of this post. Gariz Leather Straps – (Amazon) – Cheap China made stuff. They’re not bad though. You can also get a similar product from Black Rapid, but I really like the C-Loop Mini for this smaller camera. I use the Mover 20 for this camera. It allows me to fit the camera and a conversion lens. You could probably get away with the 10 as well. I don’t have very many cases but there are a few that have caught my eye. Check out the HardGraft Box Camera Case. Ona also has some great stuff here on Amazon. Fujifilm has been updating their camera flashes. I’ll list them all soon. I like to own a lot of micro fiber cloths because they eventually collect oils from your fingers or from whatever is left on the lens and I consider them disposable. I’ve owned several Rocket Airs now and they are great. I keep losing them for some reason.